I have always been deeply interested in better understanding the pressing environmental issues that we as a society are beginning to realize. I originally was attracted to Dr. Elena Litchman's Lab at the Kellogg Biological Station because of her interest in global climate change and its impacts on aquatic systems, specifically harmful algal blooms. When I was offered the opportunity to take part in some ground-level research investigating how we, as ecologists, might offer unique insight into optimizing biofuel production from algae, I immediately became invested. This research seems to be a culmination of the odd trajectory I had followed throughout my undergraduate education. Researching an emerging alternative energy source is a multifaceted topic that offers unique opportunities to not only take part in the R&D of the technology, but also gain insight into the intersection of policy construction and science. This topic has also resulted in a growing number of outreach opportunities that have allowed me to take my personal research interests into STEM classrooms and engage students with cultivating a potential energy source of their future. Piecing Together Profitable Algal Communities The overarching goal of my dissertation work has been focused on better understanding how algal biofuel generation can be optimized in outdoor, open pond systems (raceway ponds). These ponds will be exposed to the ever-changing environment, daily to seasonal changes, which has significant impacts on how algae grow. Understanding how fluctuating environmental conditions influence algal growth and lipid production is paramount if these outdoor mass cultivation ponds are to realize high levels of productivity. As ecologists, we are quite familiar with a huge body of work that has been devoted to better understanding how environment can impact population and community dynamics. From this ecological theory we know that there are a number of benefits that can be realized through the simple process of increasing the number of species that are present. 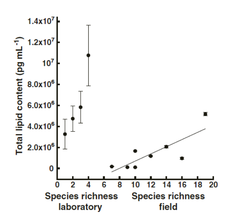 Pulling from these benefits of biodiversity principles, Mia Stockenreiter showed that as species richness increases, so does the overall lipid production of algal communities! This was the first work to extend these ecological principles to a parameter other than biomass. This work has become the foundation for our lab's algal biofuel research through promoting species diversity. Trait-based Approaches As discussed previously, fluctuating environmental conditions can have significant impacts on the overall productivity of algal biofuel ponds. Throughout my dissertation work, I have focused on investigating how fluctuating light and fluctuating temperature impact the growth, lipid production and fatty acid profiles of individual species of algae and an assemblage of these species (mixed species community). I have recently begun collecting algal "traits" under different environmental conditions to better understand how individual species respond to their environment, and I then plan to use this information to begin assembling communities of algae that even under fluctuating environmental conditions will still remain highly profitable. See figure below and/or see our recently published paper on the topic. Fig. 1. Open ponds A-D represent hypothetical outdoor ponds experiencing different ranges of temperature and resource (light, nutrients) conditions. 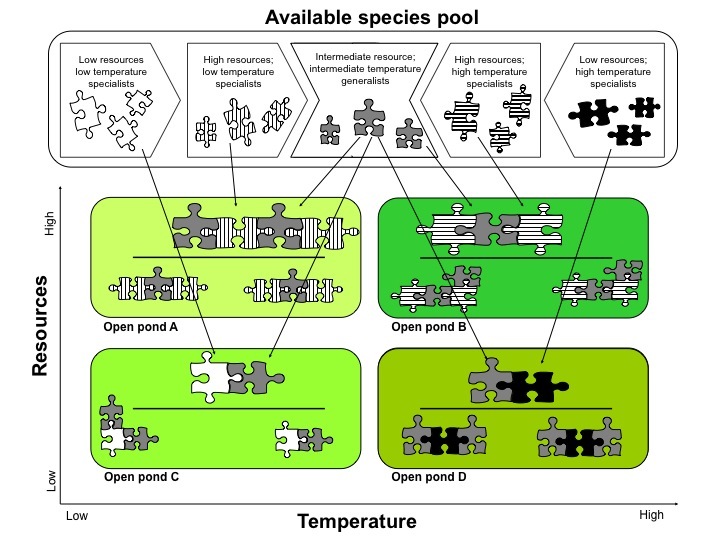 The available species pool represents a large number of species with known traits, allowing them to be grouped into categories of specific temperature and resource ranges. Some species are more specialized in their temperature-range tolerances and nutrient demands (i.e., low temperature and low resource adapted). There are also intermediate species, or ‘generalists,’ that thrive around the environmental averages, which is an essential attribute as these environments experience fluctuating conditions. When species compositions are pieced-together to optimize trait complementarity for the specific range of local environmental conditions (from both specialists and generalists), these systems can over-yield in terms of productivity even as conditions fluctuate. For example, Pond A’s local conditions are high to moderate resource levels (light and nutrients) and low to moderate temperatures. Trait-informed assemblages would be constructed from local taxa that draw from both low thermally adapted, high nutrient-demanding species and generalist species. Jake's Brewery Wastewater Research in the News! A.) Beer 101: Water, cereal grains and hops are combined during the mashing and boil process, generating wort. Wort is then transferred to the fermentation vessels where it is combined with yeast, where fermentation begins. After fermentation and aging, the now finished beer is moved to the bottling and kegging floor to be packaged and distributed. B.) Brewery Wastewater Process: Water is generated at each step of the brewing process. Wastewater from cleaning and sterilizing the mash tuns, fermentation vessels and bottles is combined with leftover water from the brewing process (“trub”) in an equalizing tank, the first stage of the treatment process. After homogenizing wastewater over several days, wastewater is transferred to anaerobic digesters to reduce organic load (BOD) of the water. After digestion, water is traditionally sent to municipal facilities for nutrient remediation. Or, this wastewater could be used as a source of nutrients for algal biofuel generation. 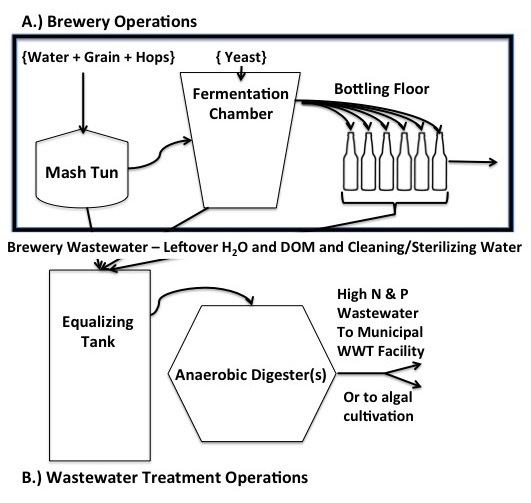 Coupling Algal Biofuel Production with Brewery Wastewater Remediation: A main economic hurdle to commercializing mass algal cultivation for biofuel production is the high nutrient requirements of these systems. This has led to research investigating acceptable fertilizer sources. One promising source would be wastewater. Wastewater can come from a number of sources, from municipal (what goes down your sinks and toilets) to the various forms of industrial wastewater. The craft beer scene is sweeping across the United States. In 2014, the craft beer industry saw a volume increase of 18%, resulting in an 11% market share of the overall beer industry and amassing a retail value of over $19.6 billion. And our unquenchable desire for beer results in a large amount of wastewater. One of the largest sustainability concerns for the beer industry is their water consumption, with an average of 7 gallons of wastewater produced for every gallon of beer produced! Cleaning this wastewater is a significant economic burden for small breweries, and has even stymied brewery's ability to grow. With a deep passion for all things beer, including homebrewing, I sought out a way to merge my two passions: algae and beer. Other than a summer Spirulina witbier, algae best lends itself to the brewing industry in its ability to thrive in nutrient rich environments, ultimately "cleaning" up the high nutrient concentrations simply through reproducing. After discovering that limited work had been done on coupling brewery wastewater (BWW) with algal biomass production, I started contacting local Michigan breweries to see if we could form a collaboration. I found a local craft brewery that was happy to provide me with BWW, and I began troubleshooting the coupling of algae cultivation and BWW remediation. After some cultivation setbacks, we began focusing on cultivating algae in wastewater post-anaerobic digestion. We surveyed over 15 species of algae across three functional groups, monitoring their growth in the BWW. We identified 7 candidate species that maintained positive growth rates. These candidate species were then cultivated separately (monocultures) and collectively (polyculture) in BWW where environmental conditions were set to mimic outdoor cultivation (high light and temperature). We monitored growth rates, lipid production and nitrogen and phosphorus removal rates through time of all the monocultures and polyculture. We were able to conclude that the polyculture maintained high levels of diversity throughout the experiment, achieved high growth and overall lipid production AND had the highest nitrogen and phosphorus removal. Benefits of biodiversity come in many measures, within this study we were able to assess whether polycultures maintained higher levels of stability and productivity, while reaching higher resource use efficiency levels through complementary nutrient requirements.